Could Alibaba be China’s next $100 billion stock market listing? The Hangzhou-based e-commerce giant continues to be coy over when it will take the plunge. But sooner or later founder Jack Ma will need to offer some kind of exit for his backers, not to mention employees, and an initial public offering is the most likely solution. Now is a good time to start asking how the company should be valued. Alibaba’s main business is selling. Its Tmall online stores provide a shop front for brands like Nike and Unilever, while Taobao is focused on consumer-to-consumer trade. The closest U.S. peers might be Amazon and eBay. Sadly for valuation purposes, there’s no perfect match: unlike Amazon, Alibaba doesn’t hold inventory or manage warehouses, and unlike eBay, it gets most of its revenue from advertising, not charging users. Meanwhile, its range of services gets ever wider, and potentially harder to value. As well as accounting for the majority of China’s e-commerce, a market worth $204 billion last year according to the China Internet Network Information Centre, Alibaba now has a mobile operating system, offers trade financing to vendors and may even start offering consumer loans. The company’s chief strategist says it aims to be “the world’s biggest data sharing platform”. Fortunately, there are two numbers that really matter. One is how much Alibaba can sell. The other is what percentage “take” it gets from each transaction on its sites. That take might come through advertising or through transaction fees, or a mixture of both. But ultimately, it represents the cash the company can squeeze out of its sellers. Other services like lending may create revenue, but for now they are mainly ways to lock in users and maintain market share. Consider a back-of-envelope valuation exercise. The first question is how big the overall market can get. Say e-commerce in China grows 35 percent a year for the next two years, and that Alibaba can keep its current market share of around 80 percent. That would give it just under $300 billion of transactions in 2014 – over four times what eBay’s marketplaces handled in 2012. Now imagine Alibaba can raise its “take” to 5 percent – roughly double what it gets now. For now, Taobao sellers use the site for free, but having reached critical mass, Alibaba should be able to exploit the “network effect” of its 500 million users to generate higher income, either by introducing transaction costs or selling more targeted ads. A 5 percent “take” would still be just a third of what eBay gets from many of its sellers, and would generate $15 billion of revenue for Alibaba. The next question is profitability. Apply a 30 percent operating profit margin – roughly the level in September 2012, the last period for which there are reported numbers – and the 15 percent tax rate many of China’s high-tech companies enjoy, and 2014 earnings would be $3.8 billion. On a forward earnings multiple of 25 times, the recent average for listed Chinese gaming network Tencent, that suggests a market value of $95 billion. In reality, many more factors will affect Alibaba’s magic number. Ma will need to time the stock market cycle, but also the tech cycle. With many foreign backers, Alibaba will most likely need to list on foreign markets, where stock buyers will be influenced by what they think of China’s regulation, economy and accounting practices. Valuations for companies like Baidu, Renren and Sina show gyrations not always explained by the performance of their underlying businesses. Valuations change quickly. Facebook’s went from $50 billion in its fundraising at the end of 2010 to $104 billion at its IPO in 2012; the company now trades at just two-thirds that value. When Yahoo recently sold half its Alibaba stake back to the company, the deal valued the company at just $40 billion. But a bilateral negotiation by with a troubled U.S. company is very different to a stock market listing. Besides, internet companies are inherently volatile. Super profitability attracts super competition, and disruptive technologies can take even established models by surprise. Netscape and Microsoft both showed how supposedly unassailable market positions can be lost as well as won. If a twelve-digit valuation is within reach, it makes sense for Alibaba to open the cave sooner rather than later. 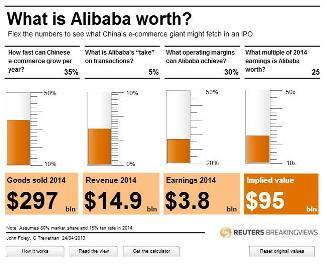 Graphic: What is Alibaba worth?